Steph Curry and the Golden State Warriors trounced the Cleveland Cavaliers last night, as the Western Conference juggernaut got some sweet revenge on national television after dropping their past four games to LeBron James and company. The game never proved to be competitive from the start thanks to the Warriors’ signature three-point shooting and the addition of Kevin Durant, and the Dubs used the TNT audience to their advantage by debuting new player exclusives in honor of MLK Day. 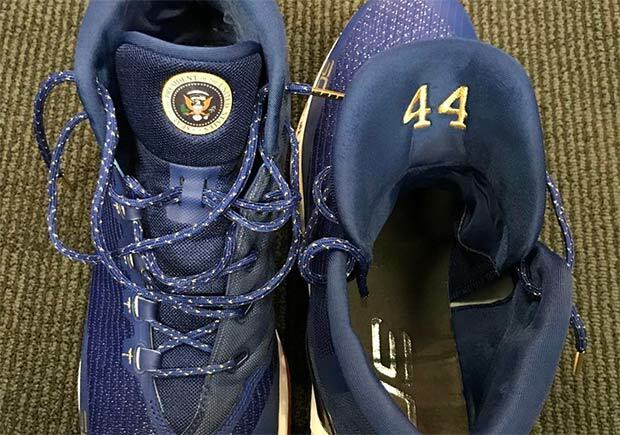 Draymond Green had his signature ‘Sideline Racism’ metallic gold Nike Basketball offering and Steph Curry honored Barack Obama’s last days in office with this Presidential UA Curry 3 featuring the official Presidential seal on the tongue and the number ’44’ stitched into the inner tongue lining. The UA Curry 3 Barack Obama PE also had the current sitting President’s signature on the red outsole while a navy upper kept the patriotic theme together. Check out a better view below.